Say hello to kid friendly footwear. Great for sloshing through the muck, these Merrell models are the new après ski boot of new millennium. There's no doubt that the moc is big with kids. 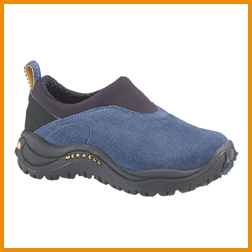 Trendy kids all over the country are discovering the comfort and ease of wear of the moc. Factor in Merrell's waterproof technology and you've got a winner in the Orbit Moc and the Reflex Mid boot. Proven Merrell all-weather moc design for all-season use. Mesh/Lycra/Neoprene 4-Way stretch ankle gasket. Exclusive, sticky rubber Merrell Reflex Cupsole features aggressive Flying V tread with all-conditions capability. Combines higher-cut support with storm-surge protection in a flyweight design that can take on kid's abilities to find wet conditions anywhere. Well-padded, all-leather upper has wide-wrap protection at the top and a high-rise molded external heel counter. Full bellows tongue seals out grit and slop. 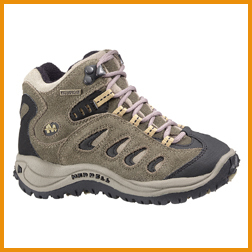 Or visit Merrell's website at www.merrellboot.com for more info.